After exhibiting at the wedding show in Dundee earlier on in the year I met with a couple who wanted me to make their wedding and engagement rings. The female client already had an engagement ring which was purchased a while ago but was not to her taste any more. As it still had the sentimental value she wanted me to use the diamonds in the ring and set them into an 18ct white gold band which was to be her wedding ring. 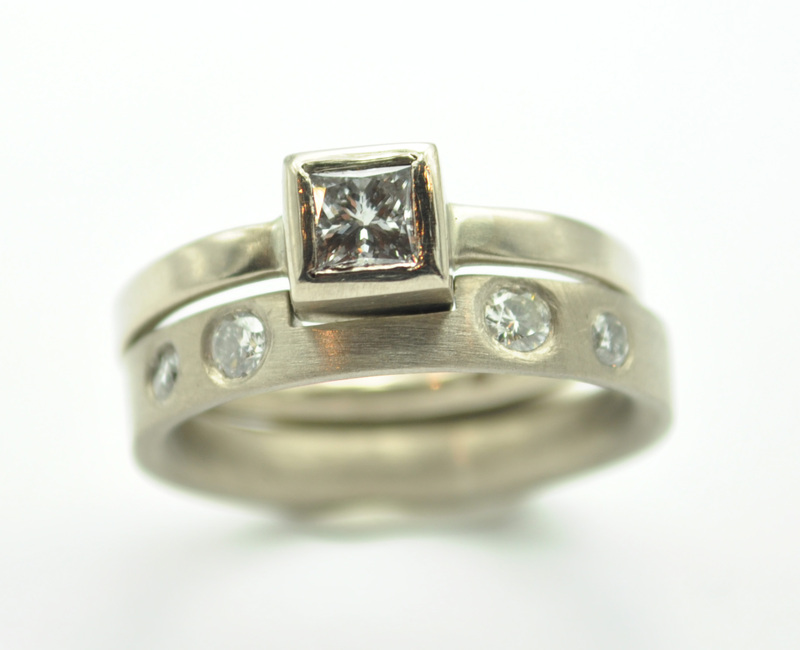 For the new engagement ring I was to source a princess cut (square) diamond which was to be set in 18ct white gold and the two rings were to fit together. And for him – he chose a simple classic silver wedding band. When I asked the client if she was happy with the design and how it turned out she said they had turned out even better than expected . I’d like to thank all my customers who have commissioned a bespoke piece, it gives me a chance to experiment with designs I might not normally produce and challenges me skills. I really enjoy taking on commissions like these. If you would like a bespoke wedding or engagement ring made from scratch or made using some of your old pieces of jewellery please get in touch.